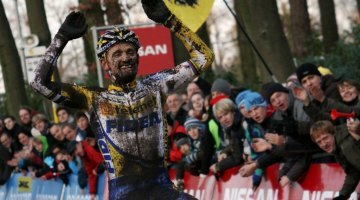 ESSEN, BELGIUM — Bart Wellens seized his first win of the 2011 Gazet van Antwerpen Trofee Series Saturday after a mechanical stopped Sven Nys on the final lap. 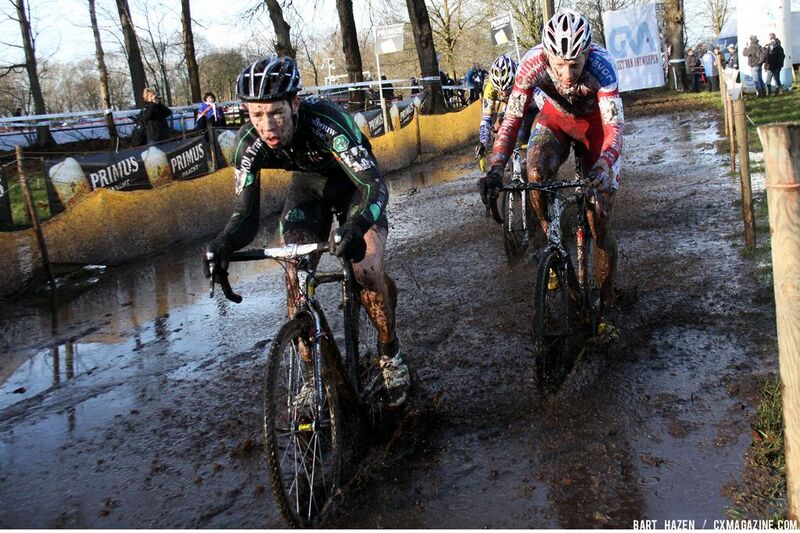 Nys, the winner of last year’s race here, was leading the GP Rouwmoer until he was forced to abandon. 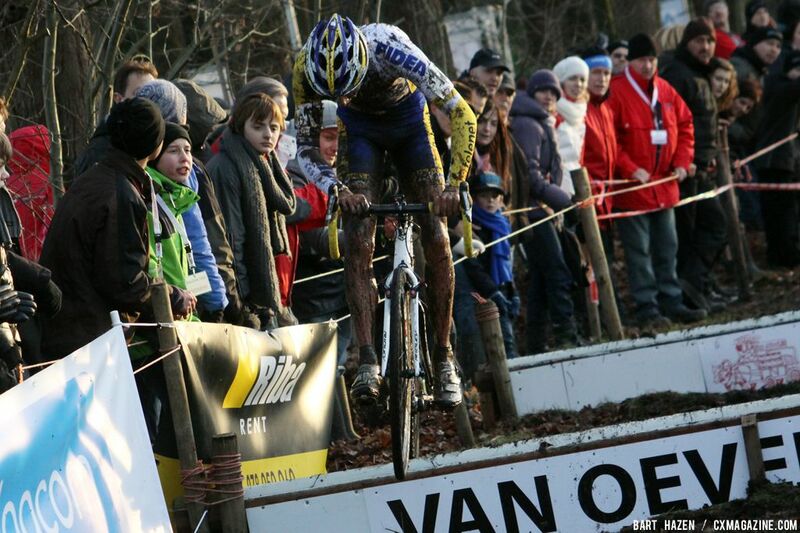 Jonathan Page, arguably the top US racer in Europe this season, finished strong in 15th spot. 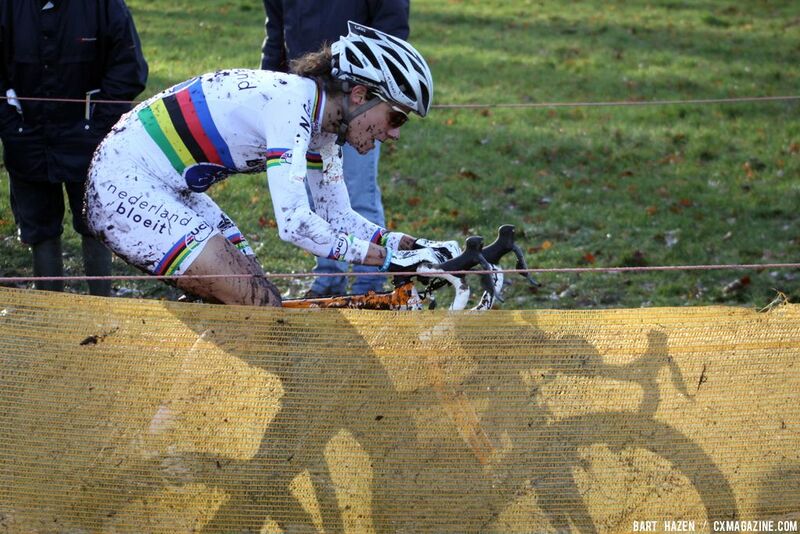 In the women’s GvA Trofee race at Essen, Marianne Vos stomped away from Sophie De Boer and Nikki Harris to take her first win of the women’s 2011 series. Mo Bruno Roy, the US-based racer who’s been tearing up the USGPs as well as New England races this season, took 10th place as the highest finishing American of the day. 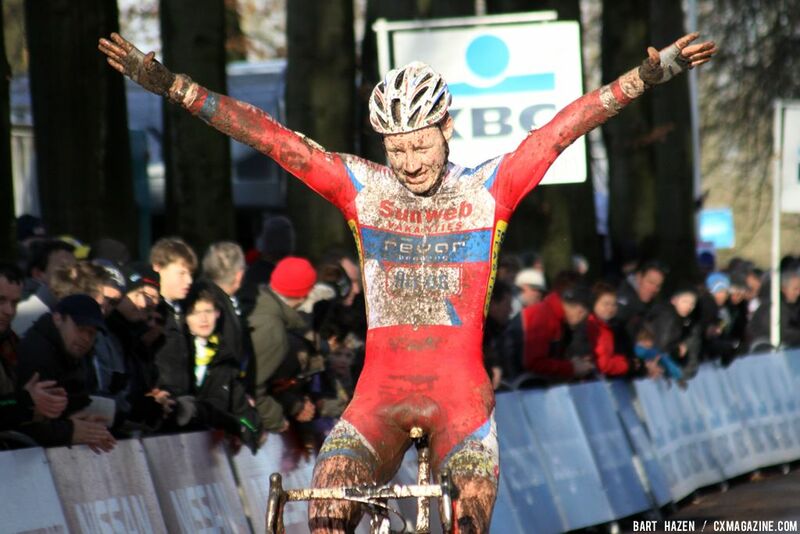 Nys looked to be in command throughout the fourth round of the GvA Trofee on a very muddy course in Essen until a problem with his rear derailleur in an especially muddy section stopped him in his tracks. Nys checked his bike briefly and then left the course, allowing Wellens, who had been trailing a few seconds behind, to solo in for his biggest in years. 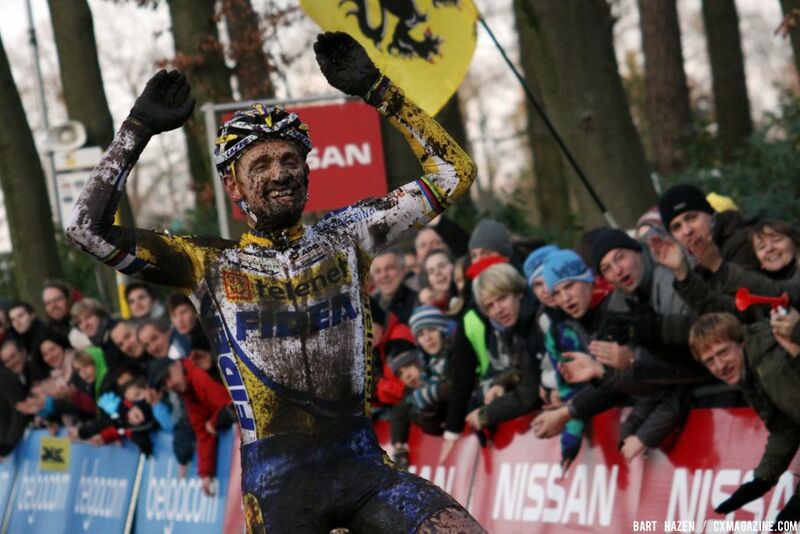 An overwhelmed Wellens told Sporza after the race that he had never imagined such a result. Wellens was always near the front in the race, beginning the early laps chasing Klaas Vantornout, who had stormed off to an early lead, while Nys and series overall leader Kevin Pauwels were caught in mid-pack traffic. Neils Albert joined Wellens in the chase, while Tom Meeusen led a larger group a few more seconds back. Wellens and Albert quickly caught Vantornout and dispatched him from the front of the race, while Nys put in an amazing ride to nearly join them in the lead. 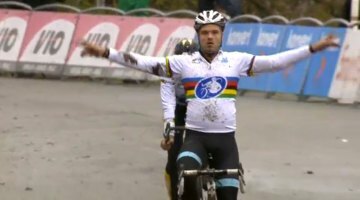 Wellens punched it again to keep his old adversary off his wheel, gaining a five-second advantage over Nys with Albert in tow. 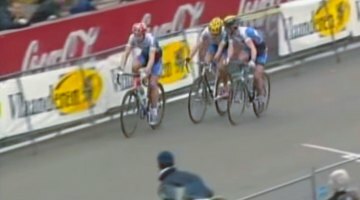 By the beginning of lap four, Wellens jumped ahead of Albert, who had been caught and passed by Nys, who soon made contact with the leader to form a duo at the front. That’s when last year’s winner of this race put in another attack, gaining six seconds on Wellens, who in turn held a six-second advantage over Albert. 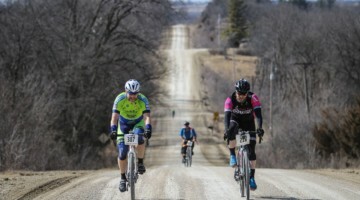 Nys was slicing through the mud over a long straight section when he suddenly dismounted his bike, fiddled with is derailleur before leaving the course in disgust. 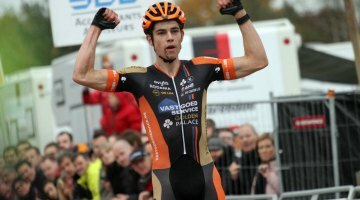 Wellens sailed by and held on for the win, while Albert followed for second in a battle with surging Rob Peeters. Pauwels crossed the line for fourth. 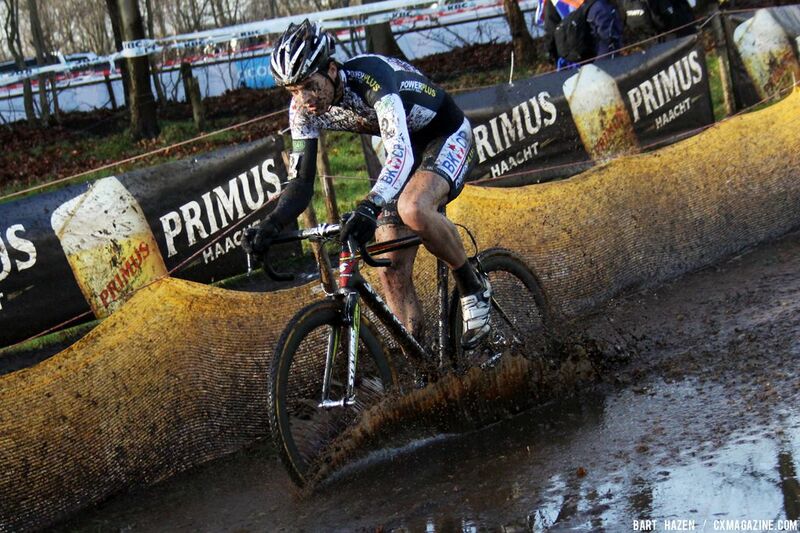 Pauwels continues to lead the GVA Trofee series with 98 points heading into the fifth round. Stybar is second with 77 and Meeusen is third with 67. 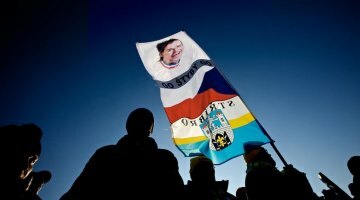 16 Katrien Thijs (Awv De Zwaluwen) BEL s.t.